Aarsun wooden Handmade Wooden Partition Screen in Mango Wood & MDF (Medium Density Fiberwood) with fine carving and finishing.The Wooden Room Divider is available in 3 as well as 4 panels and each panel comes in standard size of 20″width in front and 72″height approx.The wooden Room Dividers gives very traditional and elegant look to your home.The wooden Room Dividers can be placed in zig zag position and can be fold easily and you can easily move it from one place to another. A simply classic look is captured with this gorgeous design. 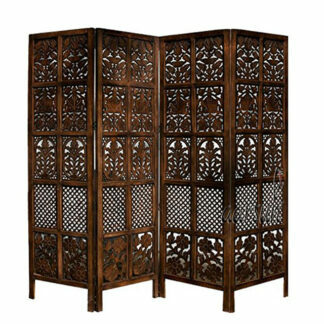 This wooden room divider will blend in easily with your furnishings, and it allows you to create privacy. 4 Panel Dark Walnut Wood Frame. Light weight, sturdy, crafted from strong, kiln dried Spruce. 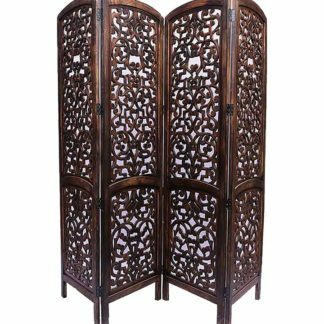 If you are looking more design & shades in Handmade Wooden Room Divider , have a look at Handmade Mango Wood Partition, also in case you require fine carving in Sheesham, go for Handcrafted Sheesham Wooden Room Dividers. Kindly Contact us at +91-81929 99135 for more details. good product, and a cooperative team to handle product enquiries and issues. Good packaging. Item is same as shown in the picture and beautiful.